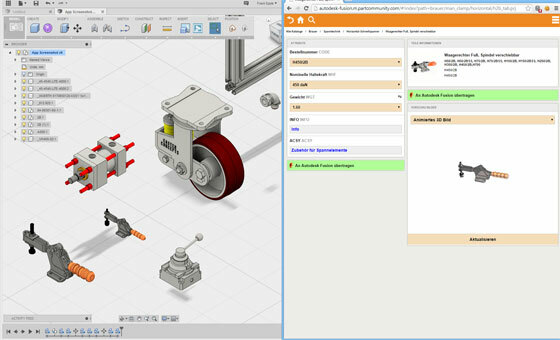 The users of Autodesk Fusion 360, a cloud supported design and planning software, can now explore and obtain numerous 3d CAD models out of 400 certified supplier & manufacturer catalogs with the newest application alias parts4cad launched by CADENAS. The users will be able to build up their models according to their choices as well as incorporate them directly into existing designs in Autodesk Fusion 360. CADENAS is the most recognized software developer in the field Strategic Parts Management and parts reduction (PARTsolutions). The parts4cad contains a wide array of simple parts like fasteners and nuts over casters, profiles and fittings up to composite assemblies like pumps, cylinders and gears. Autodesk Fusion 360 is a cloud based 3D CAD/CAM tool that can streamline the industrial and mechanical design, collaboration, and machining processes. The Designers and engineers can easily produce their product ideas in the cloud in 3D in conjunction with others they work on it. The users can access Autodesk Fusion 360 at any time and from any remote location through any mobile gadget or internet browser. The part4cad app for Autodesk Fusion 360 is priced at 7.99 and is available in Autodesk exchange apps.